Heap Sort is one of the best sorting methods being in-place and with no quadratic worst-case running time. Heap sort involves building a Heap data structure from the given array and then utilizing the Heap to sort the array. You must be wondering, how converting an array of numbers into a heap data structure will help in sorting the array. To understand this, let's start by understanding what is a Heap. What is a Heap ? Shape Property: Heap data structure is always a Complete Binary Tree, which means all levels of the tree are fully filled. Heap Property: All nodes are either greater than or equal to or less than or equal to each of its children. If the parent nodes are greater than their child nodes, heap is called a Max-Heap, and if the parent nodes are smaller than their child nodes, heap is called Min-Heap. Creating a Heap of the unsorted list/array. 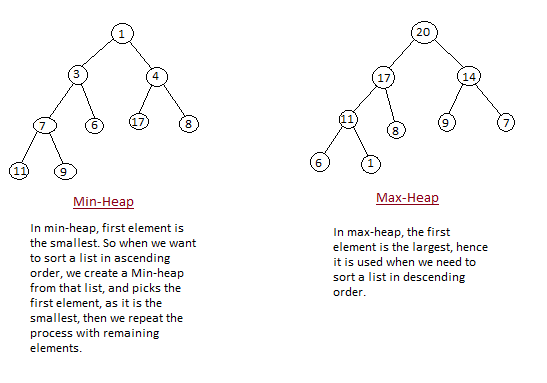 Initially on receiving an unsorted list, the first step in heap sort is to create a Heap data structure(Max-Heap or Min-Heap). Once heap is built, the first element of the Heap is either largest or smallest(depending upon Max-Heap or Min-Heap), so we put the first element of the heap in our array. Then we again make heap using the remaining elements, to again pick the first element of the heap and put it into the array. We keep on doing the same repeatedly untill we have the complete sorted list in our array. In the below algorithm, initially heapsort() function is called, which calls heapify() to build the heap. Below we have a simple C++ program implementing the Heap sort algorithm.